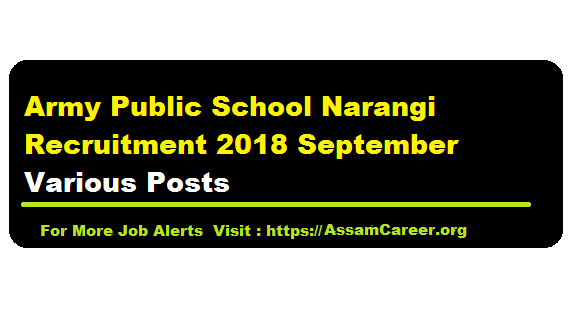 Army Public School Narangi Recruitment 2018 September – PGT,TGT,PRT, Adm Supervisor, Safaikarmachari Posts :- Army Public School Narangi has published a rceruitment notification recently in the month of September 2018. According to the Army Public School Narangi Latest Job News 2018 (Sept), Application (Hard Copy) in prescribed form of application available at Army Public School Naragi official Website www.apsnarangi.com are invited for various posts along with application, Fresh Bio Data, self attested photocopies of all relevant certificates/testimonials and one copy of recent passport size photograph. The details of the advertisement is mentioned in the following section. Master’s Degree in Zoology with Botany at graduate level. (b) Degree in Education or three years teaching experience of Intermediate or higher classes. M.Sc. Ed. in the subject concerned from Regional Institute of Education, NCERT. CSB qualified and Teaching Experience desirable. b) Degree or recognised Diploma in education. Diploma in teaching of English from the Central Institute of English and Foreign Languages, Hyderabad. CSB qualified and Teaching Experience desirable. i) (a) Graduate in/with the subject. (b) A recognised Degree/Diploma in Education. ii) B.A. Ed. with Mathematics of the Regional College of Education. CSB and CTET/TET qualified and Teaching Experience desirable. ii) B.Sc. Home Science from any University with B.Ed. CSB and CTET/TET qualified and Teaching Experience desirable. i) (a) Graduate in/with the subject concerned or its equivalent. (b) A recognised Degree /Diploma in education. ii) B.A.Ed with language concerned of the Regional College of Education. CSB and CTET/TET qualified and Teaching Experience desirable. i) Graduate in the subject & B.Ed. from recognized university with 50% marks in either. CSB and CTET/TET qualified and Teaching Experience desirable. Consolidated pay: Rs. 22,300/- per month. Educational Qualification: Applicants must have M.A. (English). Effective Written, Spoken Communication and Presentation Skills, Content Development. Experience in conducting communication classes, working with school students and Language Lab training from institute of repute. Educational Qualification: Applicants must have Bachelor Degree & B.Ed. from recognized university with min 50 % marks in either. CSB and CTET/TET qualified and Teaching Experience desirable. Educational Qualification: Applicants must have Ex-JCOs/Hony Offrs. Ex-quarter master preferable. Pay: Consolidated Pay: Rs 9,750/- Per Month. Educational Qualification: Applicants must have Preferably matriculate or 10 year service (Ex-Servicemen). PO: Satgaon, Guwahati – 781027, Assam. Last date for submission of application form (hard Copy) is 15/September/2018. b) Interview for Sl No. 7 to 10 will be held on 20 September 2018. 1) Application sent through Email will not be accepted. 2) The school will not be held responsible if application sent through any form of post or courier services is delivered after the last date of submission. 3) Army Public School Narangi reserves the right to reject/cancel application if found not suitable. Such applicant will be notified over phone. 4) Only prescribed Application Form available at www.apsnarangi.com will be accepted.